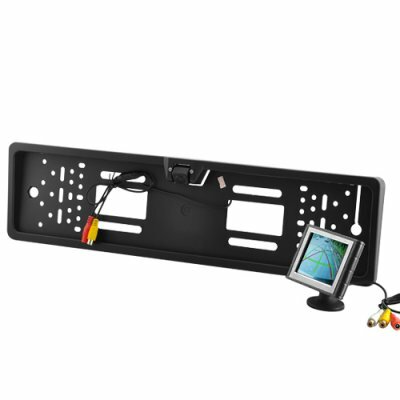 Successfully Added 3.5 Inch Rearview Parking Monitor + EU License Plate Rearview Camera to your Shopping Cart. 3.5 Inch Monitor + Rearview Camera for use with European License Plates: The safest and easiest way to see what’s hidden behind your car when parking or reversing. Once installed, connect the camera to your 3.5 inch monitor for a crystal clear and wide-angle display of whatever is hidden behind your vehicle. Everything is powered by car itself and when the car is in reverse the rear view screen will automatically turn on, adding even more convenience. Finally, when viewing your display monitor, a measurement like graphic will even appear to help you estimate distance. This Rearview Camera (Waterproof, EU License Plate) with 3.5 Inch Monitor is compact and an easy DIY installation (do-it-yourself) accessory that makes parking and reversing much safer. Available in our warehouse now, order yours today and we'll express ship it out tomorrow. Brought to you by the leader in China Electronics - Chinavasion.